The promise of democracy delivers little for those with empty wallets. Genuine freedom will be established when economic rights are entrenched as human rights. Economics is the Greek term for the management of the household. To economise is to get the most for the least amount of effort. In today’s world, these two terms have been turned upon each other in a battle between healthy households and savvy speculators. Those looking to economise have taken the term literally, buying and selling real estate for an easy profit with little real effort or risk. Their main skill is engaging in a speculative study of households. Speculators understand that communities who benefit from new public infrastructure or the existence of a creative arts scene will soon draw added attention. This attention is delivered as a free lunch to landowners via rising property prices. In the meantime, households are too busy working to notice that it now requires two income earners to meet the demands for an average mortgage in many countries. Households are led to believe There Is No Alternative. Fannie Mae has recently taken to economise by bulk selling foreclosed homes by the thousands to large investors. Investors receive a group discount, for which they are expected to use repairing derelict properties to put on the market. This is a contradiction in economic behaviour. It is well known in the upper echelons that the land is what goes up in value, not the house. There is little motivation to renovate. These mega landlords, the over-lords of so many people’s lives, will in effect drip feed the market by holding Real Estate 4 Ransom to maintain rising property prices. They know that the land will go up in value over time, so the use of houses by families matters little. The cover story has been that the majority of such sales will be sold as occupied units. What will happen with the remaining foreclosures, many of which are vacant? It is now cheaper to buy than rent. According to Deutsche Bank, the rent-buy ratio is at a record 114%, and above 100% for the fifth consecutive month. With manufacturing wage levels decimated during this Great Recession, savings possibilities are minimal. Workers have been crunched with both lower wages and higher rents. The drip feeding of houses to the market will ensure this situation continues. The banks have been bailed out. Now it’s the property speculators turn. Chicago’s Pritzker family will be rubbing their hands together. The Great American Dream is being locked up for the 1%. Ben Bernanke is literally begging for the creation of the next bubble. Low interest rates have given cheap money to speculators to dive into the foreclosed market and snap up prime locations. The latest US census data showed there were 24 vacant homes for every homeless person. This is a sign that home prices should fall further, especially now that the robo-signing fiasco is over and foreclosures are expected to rise again. This is a danger to the banking industry. The solution to the housing over-supply issue has been to demolish houses, board up entire suburbs and keep them as shadow inventory. With the Real Estate 4 Ransom practice alive and well, now we are seeing policies to encourage a greater concentration of ownership amongst the 1% with these bulk sales. Fannie Mae is effectively asking the Warren Buffett’s of the world to go ethical in their selling strategies. This is clearly against economic behaviour and against their legal obligations to shareholders. Policy makers know this. One can only deduct that the road to neo-serfdom is accelerating with each and every policy manoeuvre. A future of multi-generational mortgages where 40% of incomes to housing costs appears to be brand Obama’s change you can believe in. But if rents are on the way up, why wouldn’t landlords rent out these properties? The key issue for this Real Estate 4 Ransom atmosphere is not just the cheap money, but the cheap holding costs of owning these properties. Property taxes were once an effective tool to break up the mass monopolies of our scarce locations. This was learnt in the Gilded Age through the teachings of Classical Economics. However, this knowledge has been written out of the economic policy framework. It is as if Flat Earth economics pervades our thinking. Economic policy makers have decided “Land in prime locations abounds for all. The earth is not valuable. Living in an inner suburb has no advantage over property in the sprawl. There is no market power differential between the owners of the earth charging higher rents and your local bakery deciding to increase the price of bread.”It is as if high housing and commercial property prices are good for international competitiveness. What has been lost from the traditions of Classical Economics is that higher property taxes act as a counterweight to mortgage debt. A home buyer will pay less for a property with a tax liability attached to its land value than for one without. The real estate, banking and insurance sector, what Professor Michael Hudson calls the FIRE sector, don’t want this understood. The dominance of the real estate sector in print advertising assists in the filtering of key systemic learnings. Higher land prices mean a greater interest stream for the lifetime of the mortgage contract. Real Estate agent commissions and insurance premiums also benefit from this arrangement. It must be remembered that the catalyst to the Global Financial Crisis was the bursting of the land bubble. Banks were forced to write down their books to reflect lower land values. Derivatives imploded. The supply of credit collapsed. Corrupt banking practices were certainly a major contributor, but more analysis needs to be spent on how property taxes (more accurately Land Value Taxes) can keep a lid on land prices in the first place. 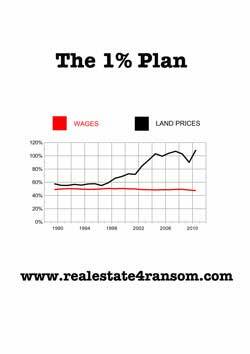 If the land price was kept low with holding charges acting as a counterweight, banksters would find it less lucrative to create exotic financial tools for land and housing. Instead of looking at root causes, the ‘solution’ to revenue short falls has been to raise sales taxes in the UK, France, USA and New Zealand. Sales taxes are a regressive tax, falling on the poorest hardest. But this is the tax pathway we are being led down. The message is: ditch property taxes and ditch progressive income taxes in favour of more pain for the unprivileged. Attention is diverted to anything but the land bubble. Economics is kept as a dismal science so that we the people don’t catch onto the subtle subsidies provided to the owners of the earth. Land values are created by the existence of community. If no-one lived in your city, land values would plummet. If the people re-appeared, land prices would jump again, as if by magic. Think about that for a minute. This is the free lunch, the economic rent that economists have been taught to ignore. This magic money is created by the development of households. As Winston Churchill famously quipped “Land is the mother of all monopolies”. This warning of the dangers of monopoly must be studied so we can apply it to keyboard capitalists now extorting markets in commodities, water rights and even our DNA. Once the profits are harvested, a tax haven of choice is on offer. The Bahamas for beach lovers, Leichenstein for skiers. Modern day capitalism has become an arena for the privileged to force up prices for scare resources, pressing the 99% to beg for access to what were once human rights. Entrepreneurial genius is now a quest to ring-fence resources. With the mobility of capital and the benefits of foreign investment set in stone, future property bubbles are guaranteed. The modern world needs an automatic stabiliser to ward off these damaging boom bust bailouts. The trend continues because economic policy has been exempted from the damage property bubbles cause. US criminologist William K Black states that this Great Recession has cost the American household sector alone a whopping $11 trillion. To re-balance this playing field, the tax code must be ‘occupied’. Classical economists such as Adam Smith, David Ricardo and Henry George understood the importance of the unearned income that attributes to owners of natural resources and licensed monopolies. A resource based economy will be possible when our economic rights are re-established as part of the common-wealth. The devil is in the detail of our tax system. Taxes must be switched off our hard work and onto the scarce resources that magically increase in value over time. Land in prime locations is like a giant invisible oil well that must be tapped for the public’s benefit to free us from a life of mortgage debt and monopoly power. Karl Fitzgerald is the Co-Director and Producer of the documentary Real Estate 4 Ransom.